How do you recruit and retain the best talent for one of the largest hotel chains in Saudi Arabia? 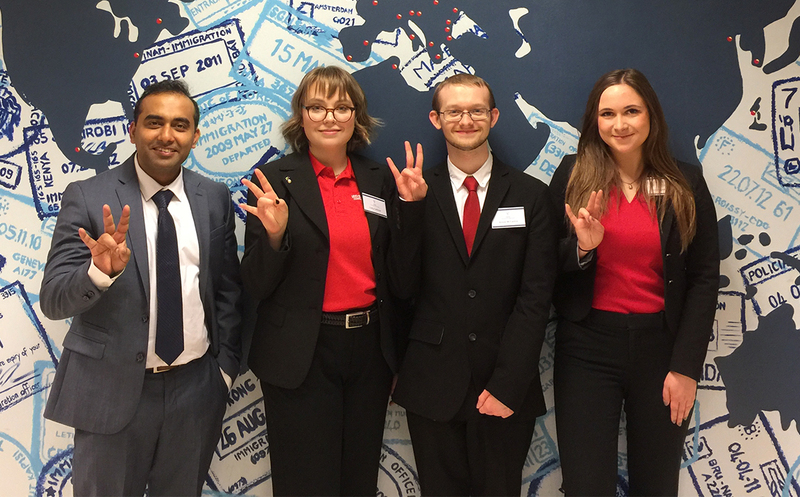 On Nov. 26-29, students Cady Calhoun, Kevin McCaslin and Lindsay Beauregard presented their most innovative ideas to a panel of industry executives at the Genio Worldwide Innovation Summit, hosted by Hotelschool The Hague in Amsterdam. The students, all members of the Eta Sigma Delta International Hospitality Management Society, attended the event with faculty advisor Dr. Priyanko Guchait. Student scholarships for the Summit were provided with funds from Rockett Study Abroad Scholarships. It was the first time Hilton College has been invited to this annual competition that brings together students from top hospitality schools around the world and industry professionals for several days of learning and networking. The Hilton College team began working on the challenge about a month before the Summit convened, formulating an executive summary and presentation that included aspects of human resource strategy, recruitment, a five-year workforce plan and an innovative restaurant concept. In Amsterdam, the students were greeted with a jam-packed schedule that included orientation, a keynote address, industry workshops, a CEO forum, a networking social and, of course, their project presentations. Dr. Guchait said the team’s impressive performance has earned them another seat at the table next year. McCaslin, who is set to graduate in May 2019, said the experience was invaluable to his development as a hospitality student, and would recommend it to anyone wanting to expand their global network.